It's the first week of December, which means the holiday season is in full effect! Our halls are decked, and I'm ready to celebrate from now till the new year! Once again this year I've ousted jolly old red and green in favor of a color palette that works better with our home. With a base of blue and white, I've added in a lot of pops of green and orange. 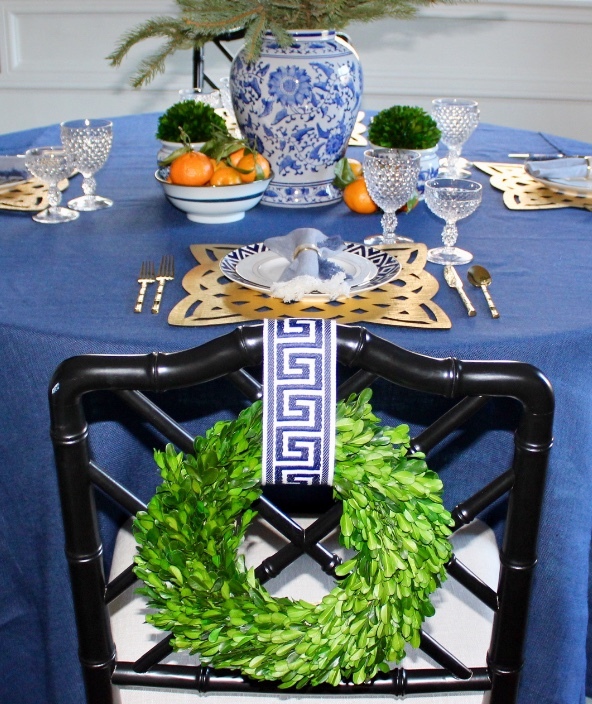 Natural elements are always fun to style with and since it's Christmastime, greenery and citrus seem like a perfect fit. I've also added in some golden accents to make the space feel a little more special for the holidays. From bamboo flatware, to star bust stocking holders, a little gold goes a long way and helps to make the whole space shine.